Hi Graham my name is Steve O'Bray my father is Dave O'Bray and he built many of the boats you talked about. My grandfather Bob O'Bray started the boating lake when he left the Royal air Force. If you have any photos from the boating lake I would love to see them as we don't have any. I was a small child when the boating lake was in full swing and remember little from them days. But my dad would love to see them. He is in his 70's now. This is quite a recnet paddling pool and is still there as far as I am aware. When I worked this area in the 90's I was constantly having to go here due to smashed glass in the pool and graffitti in the shelters. The sandpit (ex boat pond) was no better with glass and needles!! The only boating lake I knew was the small round one between the railway station and the seawall, beside the fairground as seen in Trev's postcards linked by darrenh. The one in the canal came later, after I'd left the island, and apparently was short-lived. I was expecting a picture to go with Smiler's post, his directions don't mean much without a picture. There was a period, possibly 1940-45, without boats when it was used as a paddling pool and bathing pool for small children, it was at most 2 ft deep in the middle, or more likely 18in. I very nearly learnt to swim there. Perhaps that's why I only knew it as a pool, not a lake. But I see from Trev's postcards that it it was mostly known as a lake, but it's a pool on a couple of them (possibly late 40s). His earliest cards of the lake could be late 30s. I am not talking about the small lake [pond] in colin haggarts reply #4 Sheppy Bottles & minsterboy are right and sylvaticus my directions did say half a mile outside of Sheerness and sorry I don't have a photo. As somebody who's lived on Sheppey since being born in 1947, the pool by the fair was always known as the Paddling Pool, although it did have small boats on it at one time, the canal between the Halway Road and Bartons Point was known as the Boating Lake. You are right, Sheppey Bottles, it look like there is a bit of confusion over which boating lake, after Smiler's post. Most people refer to the boating lake being the one by the amusements, I guess that is because the other one by the canal has not been used for many years, so may be it's been forgoten about, it's the one by the fair that most folk talk and know about. I thought the boating lake refered to ran into Bartons point at one end and came out near monkey farm on the halfway Road. I have not lived on the island that long but seem to remember boats being hired in the corner by the canal bank Just down from monkey farm. They used to feed the ducks in that corner as well but they seem to have gone now. This was salty water ( and still is) with crabs and jellyfish, across the other side of the road it was freshwater where we caught Rudd and Tench. I bet I have got the wrong lake if so I will get my coat! 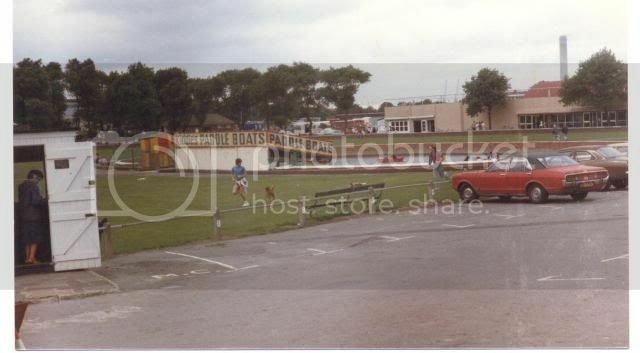 My photo of the boating lake, taken in the mid 1980s, now it's a sand pit. It was run by the Obray family. During the summer in the late 1950's-early 60's their skiffs and canoes used to be anchored down the middle of the Canal (as it was known), at night, and brought alongside the shore during the day. In the winter they had a compound on one side where the boats were stored undercover. Once a year their was a regatta style event their which most of Sheerness attended. Their was a "greasy pole" competition on a greased up pole out over the water and fathers, etc were invited to try and stay on it for as long as possible. There was also "Sweeps and Flour-men" fights out in the skiffs where the two sides pelted each other with soot and flour.